America has a Tyrannosaurus rex named Sue; now Australia has a plant-eating dinosaur nicknamed Zac. 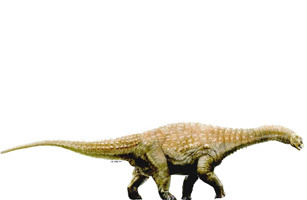 He's a 97-million-year-old sauropod, a long-necked giant similar to what used to be known as Brontosaurus (that dino has been renamed Apatosaurus). Zac is significant not so much for what it is, but for what it represents. Australia has never been known as dinosaur country. But the sheep farm where Zac was found, near the town of Eromanga in North Queensland  and where a dino called Cooper was discovered in 2004  appears to have hundreds of skeletons lying close to the surface. That promises to give paleontologists a rich window into a time and place in dinosaur evolution that has been, until now, largely unknown.